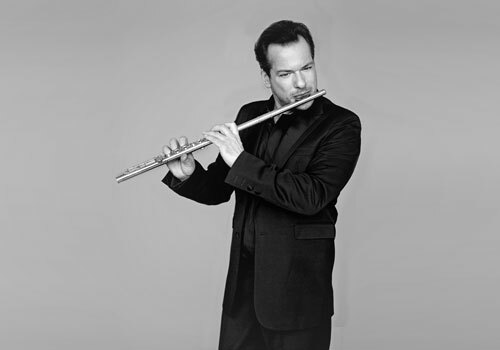 A true star flutist, Emmanuel Pahud possesses the curious ability of renewing himself, multiplying his roles and defying expectations. He is a highly sought-after soloist who captivates audiences in Europe, Asia and the Americas; a dedicated chamber musician whose colleagues range from harpsichordist Trevor Pinnock to long-time friend and pianist Éric Le Sage; a member of the illustrious Berlin Philharmonic; a tireless creator of contemporary works; the only flutist in recent years to sign an exclusive contract with a prestigious recording company; an accomplished jazzman who dialogues with pianist Jacky Terrasson; a pedagogue who slots master classes in the rare empty spaces in his agenda; co-founder of the Festival de l’Empéri in Salon-de-Provence. Pahud flies all over the globe like other people take commuter trains. Amazingly, he shows no sign of spreading himself thin. With the students at Domaine Forget, he will also revisit repertoire ranging from baroque to contemporary, including necessary detours into orchestral excerpts. “I’d like to be able to come every two years, but my schedule doesn’t allow it. I like getting back together with young people from North America, with musicians I wouldn’t see so often otherwise.” He also loves Charlevoix’s unique surroundings, which brings him a new perspective, and finds great pleasure in resuming, almost instantly, friendships born during one of his previous sojourns, as if his absences were mere parentheses. “It’s important to transmit accumulated experiences, and I have a lot to tell the students,” he affirms. “Being obliged to express ideas in ways we’re not accustomed to, taking a new look at certain difficult aspects of playing, or being surprised when a young musician plays an arduous passage with ease, facing situations we hadn’t anticipated: all these unexpected moments are inspirational. The process is fundamentally an exchange, equally enriching on both sides.” Pahud confesses a preference for young musicians of fiery temperament, whose energy has been patiently channelled during their first years of training and who are primed to develop a unique expressive potential. Music has dominated Pahud’s life from his earliest years. This child of travelling parents was born in 1970 in Geneva (he shares a birthday with the celebrated Wolfgang Amadeus), took his first steps in Baghdad, and at five years old was hooked when he heard Mozart’s Flute Concerto #1 being played by a young neighbour in Rome. A few months later, his parents presented him with a flute and lessons, although he admits today he had never imagined the importance the instrument would have in his daily life, or that it would become “an extension of breathing” for him. In 1978, the family moved to Brussels, where he studied under Carlos Bruneel, principal flute of the orchestra of the Théâtre royal de la Monnaie. At 14, he won the Concours national de Belgique and played, for the first time with an orchestra, the concerto that had been a key factor in shaping his destiny. The young Emmanuel continued his studies at the Conservatoire de Paris under Michel Debost, Alain Marion, Pierre-Yves Artaud, and Christian Larde, graduating with that institution’s first prize. He went on to study with Aurèle Nicolet, a major figure among 20th-century flutists. Competitions and awards followed each other at a dizzying pace. In September 1992 he won first prize at the Geneva International Music Competition; in October, Claudio Abbado offered him the position occupied by Nicolet from 1950 to 1959 (and held by Sir James Galway from 1969 to 1975): principal flute of the Berlin Philharmonic Orchestra. Save for an 18-month sabbatical before 2002, Pahud has happily held the position since then. Pahud isn’t necessarily aware of the exact moment the magic occurs in a concert. The memory of it may come to him in flashes, while listening to the radio in a taxi or thinking of a place. “Music is a coded language that allows us to make the air vibrate, that evokes emotions and gives everyone a chance to make their own movie,” he says. “In this role, it has much more suggestive power than literature or cinema. It becomes the secret garden of each one of us: the composer, the audience members, and the performer.” According to him, the performer’s role should be taken literally as that of a translator of another person’s language and thought, rendered by means of the artist’s particular understanding, language, and sensitivity. While appreciating the challenges in the creation of contemporary works, the musician is also conscious that these excursions into the 21st century have influenced his approach to the repertoire and his view of the future of performance as the marriage between the traditional and the new. If the term “tradition” seems somewhat dated, he maintains that tradition must necessarily evolve. As he explained in a 2003 interview: “Our memory of and our distance from events and creations are constantly progressing. Artists like Furtwängler, Karajan, Abbado or Rattle are or were in line with tradition, and make it evolve. Completely unconsciously, they nourish themselves on the past to define the future. That is part of the secret of these great artists.” In life as in music, Pahud is a proponent of movement and admits to constantly looking ahead in spite of his immense respect for those who paved the way for him, notably Sir James Galway, Jean-Pierre Rampal, and Aurèle Nicolet. Allergic to labels, he prefers to be seen as a chameleon trying to adapt to the colours of the music he is defending, each phrase bringing him closer to perfection, which, he readily acknowledges, is unattainable.